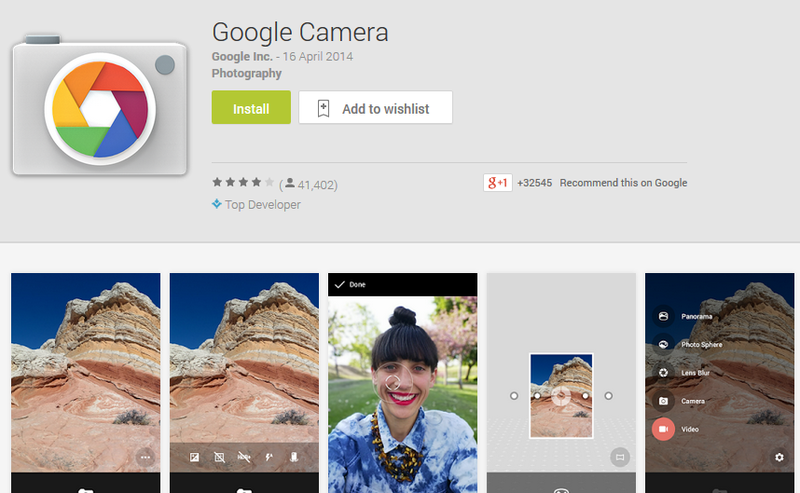 Google Search, Google PlayStore, Google Play Music, Google Plus etc and now it's Google Camera. There are so many Apps, Softwares and Tools from Google and this time around, the newly launched App named 'Google Camera' is a refreshed Camera App for Android Devices. This Camera App brings a new feature along which is called Lens Blur. Lens Blur simply allows users to change the depth of field of a photo after its capture while the dedicated slider makes the change of the point and level of focus possible. Not only that, Panorama mode has also been improved allowing users to capture panoramas in high resolution. For your information, Google Camera is a nice and smart Camera Application for any Android Smartphone but the little problem we have here about this Camera is that it's only available for Android smartphones and tablets with Android 4.4 KitKat and above.I wouldn't have called it a problem but I did just because of the fact that so many of us still find ourselves using Android 4.3 or below on our Phone except those that updated their device to Android 4.4 or those using the latest Android 4.4 KitKat Smartphones like Samsung Galaxy S5, Sony Xperia Z2 and others. To download Google Camera on your phone, click on the download link below. Are you running the 4.4 version of Android on your Phone ? You can drop a comment about the Google Camera after trying it out on your Phone. Be kind enough to make others aware, don't forget to share this post with them. Blessings !! !